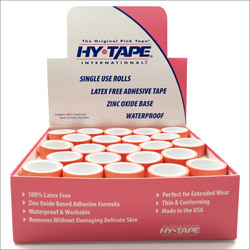 Single Use Tape Roll Kits · Hy-Tape International, Inc. Available in 2 different tape widths. In times when bacterial transmission and contamination is a risk, medical professionals can rely on Hy-Tape Single Use Rolls. Our Single Use Tape Roll Kits come in both .5″ and 1″ rolls. For international orders we recommend calling 1-800-248-0101 to arrange the most cost effective shipping method.